The Ravens went into the draft and had a list of players ready for their 1.32 pick. 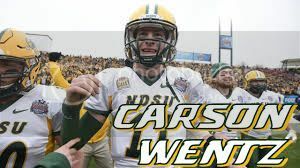 None of the names was QB Carson Wentz. As the draft unfolded and around pick 1.26 we started hoping that Wentz would fall to us. Well he did and we are very thankful for his slide as the draft was all about the defense in the first round. Coach Goodman spoke to the press about drafting the QB that will take the reins from Gabbert when the time comes. He told Gabbert will be the starter this season. Gabbert will be entering his 12th season in the PFL. He has won 2 Superbowls as a Raven and there is nobody else i can think of to have Wentz mentor. We will use training camp to really invest in Wentz to get him ready for when the time comes. We are very pleased to have snagged such a good quarterback who should be able to maintain our QB stability for at least the next decade. We have a pretty young team and we are very excited about the future but it fills great knowing we will also have an exceptional quarterback leading us and making our future a reality. Last night the Ravens defeated the Vikings 19-17. It was a field goal with just under 2 minutes to go in the game that put the Ravens on top and then the defense secured the win. It was the biggest win of my coach mode career and one I will remember forever. The Ravens season got started in SF and the Ravens won that game easily and the expectations after that game were very very high about this season. Well fast forward 3 weeks and the Ravens would lose all the games and sit at 1-3 on the season and a full 3 games behind in the playoff race. We knew it wouldn't be easy but still had confidence that we hopefully would make the playoffs. Week 5 was our bye week so we started looking over why we were losing these games and one thing stood out more than anything else and that was all the fumbling our running back was doing. So we started limiting the carries of HB Sims in each game and we started winning games again. The Ravens would go a staggering 14-2 (including playoffs) the rest of the season after the week 5 bye week. The offense would have its ups and downs but the defense really started to come together and I started to learn more about the personnel on the team on what they could do and what they couldn't do. I believe after the week 13 win against the Steelers really told me that my team could contend at least to get to the playoffs. Once the Ravens defeated the Steelers again at Pittsburgh in week 16 we felt very confident that we could make the playoffs but not only make the playoffs that we could be a factor in the playoffs. Week 17 was a must win and we took care of the Browns and felt relieved that we not only over came a 1-3 start but we finished the season red hot going 10-2. We won every divisional game and that there was a testament to our team that we could compete. Wildcard weekend- We drew the Raiders and we were concerned because we barely beat them earlier in the season but we had a very good understanding what they would try to do on offense. If you told me that Luck would have 341 passing yards I would told you the Ravens would lose but we played bend don't break defense and held them to FG's while we scored touch downs and at the end of the day the Ravens would defeat the Raiders 31-13. Divisional Round- At Indy- Mojo had beaten me twice in a row but both games would go down under the 2 minute warning. Our plan was to dominate the TOP and on defense we wanted to bring pressure. Both exceled in this game and the Ravens would win big 36-14. AFC Championship- Bengals- We had played the Bengals 3 times up to this point so we knew what we were getting into. The defense played just outstanding in this game and HB Rainey was unbelieveable with scoring 4 tds. The Ravens would defeat the Bengals 34-7. People have asked me how do I feel....I fell humbled and still while I write this news article it still gets me pumped up and excited because that was a hell of a game. I still remember my first ever coach mode game and yes it was against Jim Hatzis and he won that game 48-10. I said boy do I have a long way to go!!!! I have had much help from other GMs from offense to defense and I kinda developed my own thing. I would like to thank Mr. Hatzis for taking the time to call me on the phone a few years back and we talked about offense and defense. It has helped out a lot and laid ground work for the way I play today. I also want to thank the Commish. I spent some time with him talking about 4-3 defense and player attributes. He is the reason I have played some good defense of late. I also want Scotty to know he played a hell of a game last night. I was torn between recording the game and broadcasting it live. You cant do both on twitch. I decided to broadcast it live so the league could watch it live and Andrew did a heck of the job with play by play announcing. It gave me great pleasure and honor to broadcast the Superbowl and for anyone who tuned in thank you for taking time out of your day to watch it because I do not think anyone would be disappointed because it came down to the last two minutes. As I look back on this team I think I will remember them as being resilient. Even the previous season when I took over they were 0-6 and 0-8 after my first two games but I am not the type of guy that gives up on a season and we finished 8-8. Another word comes to my mind is the defense. The defense in these playoffs was just about locked in as I think you can be. Last 3 games of the playoffs no team reached 200 yards of offense so the defense was playing like the Ray Lewis's defense thus why my video is highlights about that great Ravens defense. This team will always have a special place in my heart and I am very proud to represent the PFL as the Champion of Superbowl XXXI.... Now that I have a taste of it I want more. So with that being said we are thrilled about this season but look forward to next season as we are given the opportunity to defend our title. Reaction after the Ravens defeated the Vikings in Superbowl XXXI. It was an amazing game and Ravens defense stepped up at the end to secure the win. Congrats to Scotty on a very well played game. It was tough as nails as both defenses didn't want to give the other team an inch. Coach Goodman after the game said he felt so humbled to win a championship. He has worked extremely hard since beginning coach mode and is thrilled and honored to join all the past PFL coaches who has won a Superbowl. I will do a season recap because I am still rejoicing in winning the game. The Ravens took down the Bengals 34-7 to advance to the Superbowl. They have a date with the Vikings who advanced to the Superbowl by beating the Panthers 20-19. In this playoff run for the Ravens the defense has just been superb. They need to do it for one more game. It has not been an easy road but i still think starting the season 1-3 has had the Ravens in must win mode since week 4. It will be a great Superbowl and a tough one to get a win in. Both teams are solid and both teams i can see deserve it. Both coaches will be going to the Superbowl for the first time so I expect early on some nerves to show up. The Ravens have their hands full and we are thrilled to be playing in the PFL Superbowl!!! We have to expect the unexpected and we have much respect for the Vikings team who have taken out some great coaches in these playoffs. I will enjoy the moment and share a great time with Scotty when the game is played. Whoever wins the game with join such great company with the past coaches who have taken this step and won a PFL Championship. Football immortality is on the line and we have to be ready and prepared for the moment and the task at hand. The Ravens defeated the pesky Browns team 19-3 today to earn a spot in the up and coming PFL playoffs. It was a tough game and the Ravens relied heavily on the run game and HB Rainey to move the chains and get us in scoring distances. The Browns played stellar defense as did the Ravens but in the end the Ravens put more points on the scoreboard. What a crazy season to start off 1-3 and then finish the season 10-2. Each week after the rocky start the Ravens had must win in their head. To finish 6-0 in the division is also a great accomplishment. The AFC North is so tough to win games in and we are grateful to have had success in the division this season. All the games could have gone either way but the Ravens were able to eek out some wins. With a win today coach Mike Goodman had became the Ravens all time wins leader for the club. His 19 wins in two seasons has brought hope to the Ravens fan and hope for a city that just maybe they can reclaim football immortality as they did back in the 2013 season. Hope is all we ask for and a chance to go after the crown. As the Ravens start preparing for the playoffs they will either go to the Jets or the Raiders. Both teams have had great seasons and both will be very very tough games. We are excited to get to the playoffs and hope we can make the most of this opportunity because they do not come every year in the PFL because the competition is so tough. After a very rough start in Baltimore this season the team has rebounded and are on the verge of the playoffs. Each week since starting 1-3 has been almost must wins for this team and we have responded for the most part. It does not get easy when you have to play Jim twice but we have been fortunate to come out on top both times. Every week there have been tough battles. I am proud of this Ravens team and proud to bring this team at least back to some winning football. There has not been a lot of success in Baltimore but now the FORCE AWAKENS! The Ravens won the toss and elected to kick off to the Broncos. The Broncos wasted no time and in three minutes into the game they had their first strike. It was AB Johnson hitting WR Jeffery in the end zone that would give the Broncos a 7-0 advantage early in the game. Then it was the Ravens turn as the Broncos kicked off and the Ravens would go on a 7 play 78 yard drive. In that drive, QB Gabbert would find WR Jenkins on a 46 yard TD pass and the Ravens tied the game all up at 7-7. The second quarter would prove to be the defining quarter in the game scoring wise. The Broncos would score on a 9 yard pass to WR Benn from QB Johnson to give the Broncos a 14-7 lead. The Ravens on the next drive were on a nice drive when QB Gabbert got hit and was injured. It would be determined by the medical staff that he would miss the rest of the game. Backup QB Sanchez and his old body..lol... would come in and play and soon enough the Ravens would see him go down. He wasn't as lucky has QB Gabbert as he will miss the next 8 weeks. Insert 3rd string QB Klein. The Ravens drive and Klein hits WR Martinez at the Broncos 8 yard line but we then would see him fumble and Broncos recovered. The Ravens defense started to step it up a bit and would close out the half down 14-7. Early in the 4th quarter coach Goodman made a change at HB and went with Sims. It was a very good move as Sims seemed to ignite the run game. The Ravens drove in Broncos territory but would see Sims fumble and the Broncos recover to end the drive. Very late in the game, QB Klein had a good drive going as there was not much time left in the game and would get the Ravens to the Broncos 4 yard line. It would come down to a 4th and 1 and the Broncos were able to stop HB Rainey short of the first down and Broncos took over and ran out the clock. What a heck of a game and a game very well played by the Broncos! With the injuries to the QB i thought that Klein came in and actually played very well in this game. Having to go to the 3rd QB is not why we lost this game and we could not get over the hump on this game. I made some bad choices in this game and almost all of them resulted in a turnover coach Goodman would say. Broncos played one heck of a game and almost the whole game was pretty much a possession game and his defense was better than our offense when we needed it the most. Hats off to Denver and Mr. Blitz on a very well played, well called game. The Ravens will have their season opener at home next week as the Jets come to Baltimore. They are off to a very nice start on the season and sit atop the AFC East at 2-0. Coach Goodman knows we will have our hands full with the jets but welcome the challenge and cant wait to get back out there with his team next week. The Ravens PR team released its official 2017 season hype video to the public today. The teams website have been flooded with users checking out the video and ticket sales since the video release have been selling at a rapid pace. The fans and the city are pumped up for the 2017 season and are clearly backing their home team this season. We will see how the season unfolds and it is nice to have the city on our back as we journey through the 2017 campaign surely to be filled with some ups and downs.